One reason people run so many salons is: They got the business plan from us and it was too good to say no to! Opening your own salon often comes as the next logical step for those hairdressers who have been successful at mobile hairdressing or as employees of a salon. 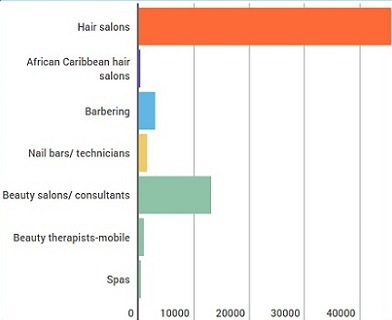 With an increasing trend towards male treatments, seeing the average UK male spend £711 per year on hair and beauty treatments, the salon industry was the UK’s fastest growing independent store sector as of the beginning of 2016. This average spending of £711 for males was a 23% increase in comparison to 2015 and for females, there was a 19% increase, with the average female spending £876 per year. It has been said that this sector is currently booming due to the changing attitudes towards the industry. The salon industry is now more mainstream and can be seen by many as a necessity rather than a luxury. Therefore, many people are investing more money and time into this industry creating huge demand alongside expansion and growth. As well as salon’s it was said that the global wellness industry grew 10.6% globally in the last two years to become a $3.72 trillion (£3.06 trillion) market in 2015. Within that, it was found that the spa market grew 2.3% to $98.6bn (£81bn) and is forecast to grow by a further 6% by 2020. This demonstrates the huge market potential across the whole health and beauty industry. The forecasts show the industry outlook for the beauty salon industry further with growth trends. Demand is determined by demographic data such as income, population density, and growth. Large companies don’t have many advantages over smaller companies through location selection or technical opportunities. Increasingly, more and more people are looking after their health and appearance. Woman account for the highest share of beauty salon industry. is there a market opening for your service? How can you differentiate so that you won’t be beaten by the competition? And how will you fund your proposal? Do you have money set aside or do you need to request a huge bank loan? If you do not have a means to differentiate massively, then you should perhaps consider buying a franchise or an existing salon name. There may be a way in that you can buy out your employer or run your salon as a family business, all of which have their advantages and disadvantages. For many people who open their own business, the main factor behind this is to be their own boss and determine their own working hours. The hairdressing and beauty business is a competitive one, and you must not be fooled that it is always easy to succeed, but with a good business plan and a good strategy in place, coupled with a strong desire to be successful then there is no reason why you cannot provide a good quality of service and create a strong profitable business. You should ensure that you research and develop your business ideas as thoroughly as possible. It is essential that you determine whether there is room in the area you want to set up in. With over a decade experience B&F business plan team is helping entrepreneurs for a comprehensive outline for starting their new business. Business plans describe a company's mission, operations, financial plan, marketing strategy, and management qualifications. Writing a business plan for a salon & Spa walks you walk through the steps necessary to open a business in the hair, beauty and spa industry.